We know that you love having unique experiences, different from other tourists. Cancun is a magical place you certainly have to visit, but if you want that visit to become an adventure of a lifetime, you have to experience it like the locals do. Here are five tips that will make that happen. If anyone knows a place is a taxi driver. Of course, they know all the touristic spots, but they’ve been all over Cancun as well. So, who better than them to take you to meet all those places only locals know? Actually, there was never an actual town in Cancun, but there’s one place that can be considered a vestige of the local origin of Cancun: Puerto Juarez. 50 years ago, a remote crossing between the mainland and Isla Mujeres started. Even the island as a municipality is much older than Cancun. In Puerto Juárez lies the Maritime Terminal of Ultramar, which is basically the crossing to Isla Mujeres and is much cheaper than crossing from the hotel zone. You will also find the best seafood options in famous local restaurants such as Mandinga, Marbella, or some other managed by the fishermen's cooperative by the seashore. 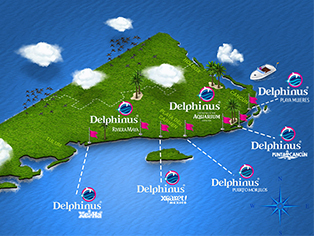 And since you are in Puerto Juarez area, you can also go swim with dolphins in Playa Mujeres, as Delphinus has precisely a meeting point of transport in the terminal overseas. An idyllic place where cultures mix and everyone’s looking forward to relaxing, have a good time and make friends. You have to live it in order to believe it: it’s the perfect place to grab a beer at one of the bars and keep getting to know the locals or meeting new foreign people you can share experiences with. Close to the center of Cancun, there are two spots frequented by ‘cancunenses’ –people from Cancun-. You can live the whole experience: live with the locals and eat the delicious typical treats of the region and witness the Mexican folklore in a mixture of local with foreigners who have already adopted the ‘Cancunian’ lifestyle. The other option is a shopping mall, the first one that existed in Cancun and that remains as a point of reference both for shopping and for finding food and entertainment in one of its bar-restaurants like Hooters. If you are looking for crafts and souvenirs to take to family and friends, Market 28 is the option. It has such a special appeal that turned the market into a place crowded by locals and has caught the attention of many foreigners who make the tour from the hotel area just to discover it. How about a meal as-cancunense-as-it gets, after an exquisite dolphin swim in the Interactive Aquarium? It’s ok if you want to visit the conventional tourist sites, but now you know how to actually start to get to know the real Cancun. The only thing that it takes to get to know more than meets the eye is precisely, to keep walking past them. To start your all-Cancun adventure, you can start here.